Nine innings were not enough for Game 1 of the Texas League Championship Series between the Tulsa Drillers and San Antonio Missions Tuesday night at ONEOK Field. With the game knotted up at 2-2 going into the bottom of the tenth, Keibert Ruiz came through with a huge, seeing-eye single just out of the reach of the shortstop that scored the winning run in the Drillers 3-2 victory. The result gives the Drillers the first strike in the best-of-five series that will determine the 2018 Texas League Champion. Tulsa has not won the league crown since 1998. Pinch-hitter Logan Landon led off the pivotal tenth with an infield single. Gavin Lux then attempted to bunt him over to second, but the Missions were able to force Landon at second for the first out. Drew Jackson followed by roping a single up the middle that moved Lux to second and set the stage for Ruiz. On the first pitch, the Tulsa catcher rolled a single into shallow left field, plating Lux with the winning run. It was an outcome that seemed unlikely for most of the night as four San Antonio pitchers combined to hold the Drillers to just one hit through the first eight innings. The Drillers took the lead in the bottom of the first inning without recording a hit. Lux led off with a four-pitch walk. Jackson then traded places with him after grounding into a force out, and promptly advanced to second on a wild pitch. After a ground out from Ruiz moved him to third, Jackson eventually came home with the game's first run on a wild pitch from San Antonio starting pitcher Michel Baez. San Antonio scored single runs in both the second and third innings. Hudson Potts led the second off with a solo home run off Tulsa starter Tony Gonsolin that evened things up. In the top of the third, Josh Naylor reached on an error, and Kyle Overstreet singled. Naylor followed by stealing third, and Austin Allen brought him with an RBI ground out to put the Missions on top 2-1. 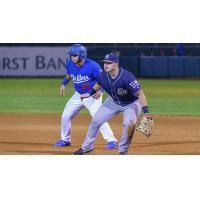 An inning later, the Drillers brought home another run without recording a hit. Ruiz and Jacob Scavuzzo walked, while Cael Brockmeyer was hit by a pitch to load the bases. Eric Peterson earned an RBI the hard way by being hit by a pitch, once again tying the game at 2-2. Gonsolin battled through six innings as the Missions had runners on base in each of the first three innings. The right-hander settled in and retired nine of the last ten batters he faced. Michael Johnson replaced Gonsolin in the seventh, and retired the Missions in order. He came back out for the eighth and got the first batter he faced in the inning before giving up a single. Shea Spitzbarth came into the game and immediately got Allen to ground into a double play to end the threat. Spitzbarth came back out for the ninth, and the Missions threatened by getting the go-ahead run in scoring position. With one out in the inning, Peter Van Gansen bounced a ball over the short wall in right field wall for a ground-rule double. Taylor Kohlwey followed with a ground out, advancing Van Gansen to third. Needing a big out with pinch-hitter Webster Rivas at the plate, Spitzbarth came through with a huge strikeout to keep the game tied. Layne Somsen worked a 1-2-3 tenth to set the stage for the Drillers walk-off rally in the bottom half of the inning. *The 2018 edition of the Texas League Championship Series is a rematch of the 2002 TLCS. The Missions defeated the Drillers four games to three in the best-of-seven championship series that season. *Lux has hit safely in all six postseason games this season. *The walk-off hit was a nice redemption for Ruiz. In fifth and final game of the TLCS last year, Ruiz made the final out in the championship for Midland. *Tulsa won despite being out-hit 8-5 in the game by the Missions.